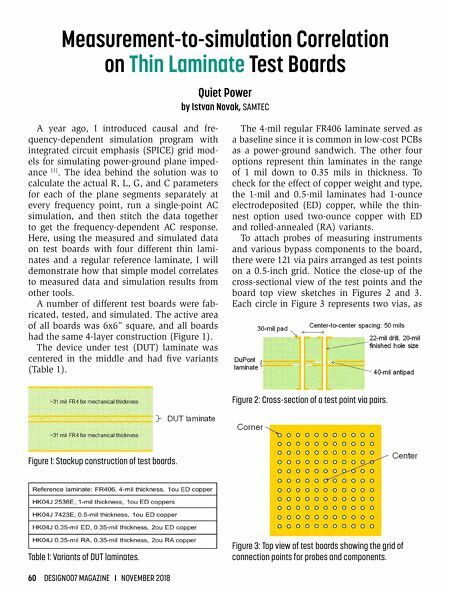 60 DESIGN007 MAGAZINE I NOVEMBER 2018 A year ago, I introduced causal and fre- quency-dependent simulation program with integrated circuit emphasis (SPICE) grid mod- els for simulating power-ground plane imped- ance  . The idea behind the solution was to calculate the actual R, L, G, and C parameters for each of the plane segments separately at every frequency point, run a single-point AC simulation, and then stitch the data together to get the frequency-dependent AC response. Here, using the measured and simulated data on test boards with four different thin lami- nates and a regular reference laminate, I will demonstrate how that simple model correlates to measured data and simulation results from other tools. A number of different test boards were fab- ricated, tested, and simulated. The active area of all boards was 6x6" square, and all boards had the same 4-layer construction (Figure 1). The device under test (DUT) laminate was centered in the middle and had five variants (Table 1). 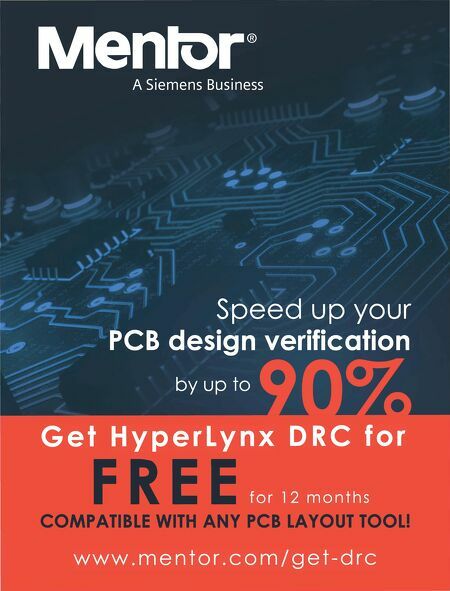 The 4-mil regular FR406 laminate served as a baseline since it is common in low-cost PCBs as a power-ground sandwich. The other four options represent thin laminates in the range of 1 mil down to 0.35 mils in thickness. To check for the effect of copper weight and type, the 1-mil and 0.5-mil laminates had 1-ounce electrodeposited (ED) copper, while the thin- nest option used two-ounce copper with ED and rolled-annealed (RA) variants. To attach probes of measuring instruments and various bypass components to the board, there were 121 via pairs arranged as test points on a 0.5-inch grid. Notice the close-up of the cross-sectional view of the test points and the board top view sketches in Figures 2 and 3. Each circle in Figure 3 represents two vias, as Measurement-to-simulation Correlation on Thin Laminate Test Boards Quiet Power by Istvan Novak, SAMTEC Figure 1: Stackup construction of test boards. Figure 3: Top view of test boards showing the grid of connection points for probes and components. Figure 2: Cross-section of a test point via pairs. Table 1: Variants of DUT laminates. Short — How Can We Design Electronic Devices That Don't Overheat? I-Connect007 Subscription and Contact Info.